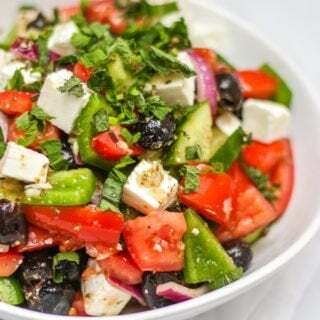 This delicious and simple traditional Greek Salad recipe is the perfect summer side dish. It never goes out of fashion when made well. The perfect reminder of holidays and hot days. So easy to make, it's low carb, gluten free, packed with tasty tomatoes, cucumber, olives, feta cheese and olive oil. Put all of the salad ingredients together in a shallow bowl. Combine the dressing ingredients together and whisk well. When ready to serve, pour the dressing over the salad and stir well.